If you are looking for new carpet in Canton, it can be a little difficult doing it alone. The carpet shopping process can be a daunting one. To avoid getting stressed out during your carpet installation, it is important to find the right carpet company. The Carpet Guys are here to take care of any of your carpeting needs. A professional and friendly sales representative will come to your home with multiple samples to choose from. Seeing the types and colors of the carpet under your own home's lighting makes it easier to get an idea of what it will look like installed. The measurements of the room(s) are taken precisely. Every inch of the floor will be covered by fresh and new carpeting. Complimentary decorating advice is given if customers are interested. Pricing and appointment times are set to accommodate your schedule. Whatever time fits you best will fit us as well. If you need time to make a decision, take it. We will never pressure customers into making a decision. We will move the furniture out of the selected rooms with no added cost. The old carpet material is ripped out and wrapped into bundles. These bundles are brought outside and stacked neatly on the curb (if accessible). The subfloor is prepared, comfortable carpet padding is put down, and the brand new carpet is installed. Upon request, the furniture is placed back into it's original placement. For all of your Canton Carpet needs, allow The Carpet Guys to handle them. We will provide you with the satisfaction you deserve not only through our customer service, but the installation as well. Installing comfortable and high quality carpeting is only one step away. 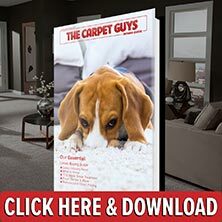 Take the time to fill out a free carpet estimate to get started today!